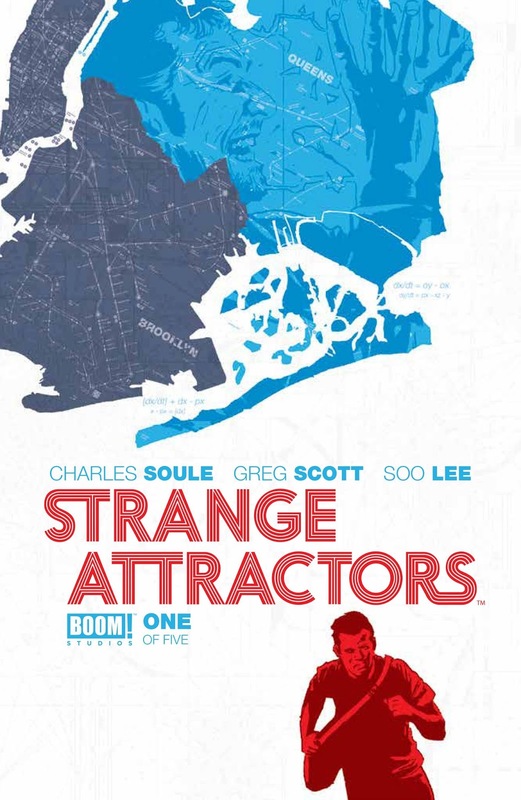 The Fellowship was fortunate enough to obtain a copy of STRANGE ATTRACTORS #1 from BOOM! Studios. Charles Soule writes, Greg Scott draws, Art Lyon and Matthew Patz color, and Thomas Mauer letters. Wilson is a graduate student working on his thesis, but he’s stuck. There are problems he just can’t quite get past, but he’s tracked down an elderly professor who might be able to help him. Brownfield did some work early in his career in Wilson’s field. So Wilson agrees to help the odd old man in exchange for help jumpstarting his own work. But what the old man has for Wilson to do is more than a little strange. The old man is hand drawing maps of the city, and he’s not particularly open about why he’s been doing this for decades. Wilson seems to be a good guy, and he seems to be smart enough to figure things out. And the underlying message is that there are patterns in everything, and that there might be something more to it than that. The detail in the art is stunning, with faces and backgrounds that are especially awesome. This is a story that go in so many different possible directions, and any of them would be fascinating. And that’s got me sold. STRANGE ATTRACTORS #1 is available now at your FLCS or at boom-studios.com.